Missed out so many Wednesday for my Wishlist Wednesday! Phew. 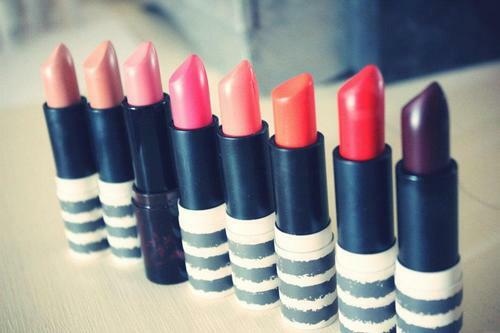 For today Wishlist Wednesday I would like to try and have "some" of these gorgeous lipstick from Topshop. Influence again by my favorite YouTuber, Zoella. I really need to have these. Despite admiring its cute packaging I also adore its various "not-so-similar" shades that they offer. Hm.. i did not decide yet on what shade should I get. It cost 8UK Pounds in the UK and RM43 in Malaysia. Pretty nice price, but still quite pricey for me. Have you tried Topshop lipstick? Is it really good like they said? Should I try it? i love topshop cream blushes!! ade yg baru tau yg in stick form..tgh half price online on topshop.co.uk..7 pound je..
ade yang ckp the lipstick is abit like Nyx soft mate lipstick.texture and the colour. Tapi Nyx slightlycheaper. I have to say, the colour selection that they offered are fantastic! The nudes are pretty wearable too but I don't like the consistency of it on my lips (dia jadi macam tak lekat sangat so weird! same case applied to NYX lipsticks but my sister loves the Topshop one!). I'm yet to try a different way to wear it bright. It's a sheer colour if you dab it on the lips. definitely buildable. And if you can't stand strong scented lipstick this might not be for you. I'm super sensitive with heavily scented products so it's a love and hate relationship with this product. The packaging is awesome in my opinion. haha. ow.. yeke.. macam xsyok ea bila pakai.. hehe... i would love if its pigmented enough. i dont like sheer lipsticks. does not make any different to my look. i am okay with scented products but depends on how it smells like.. hm.. need to try one first and if im okay, i'll pick more! <3 thanks for the opinions! Tapi lipstick MAC mmg best la, i xde byk tp mmg worth the money in my opinion.